Just how much does BGSU ask for tuition today, and how much is tuition forecasted to change? How does this compare to other schools? Keep reading to find out. Understanding the tuition you'll have to pay to attend Bowling Green State University - Main Campus will enable you to prepare a budget for the next 4-6 years. Check out the figures here to know how Bowling Green State University - Main Campus' cost measures up to other schools and if you should arrange for tuition increases. The following table outlines how BGSU measures up to other schools nationally, regionally and by state. BGSU fees and tuition is reduced significantly for students living in Ohio. For in-state students, tuition and fees is set at $11,057 for the 2017 - 2018 year, 40.5% off the price charged to out-of-state students. Tuition is $9,096 and fees $1,961. BGSU out-of-state students paid $18,593 in tuition and fees in 2017 - 2018. $1,961 was for fees, and $16,632 was for tuition. The following table outlines the costs described above for the 2017 - 2018 school year. See BGSU cost per credit hour here. 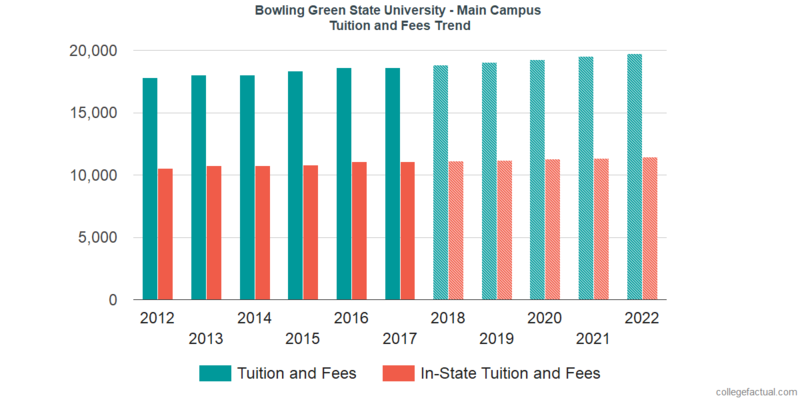 Tuition and Fees for out-of-state students attending Bowling Green State University - Main Campus grew at an average annual rate of 1.2% within the last 5 years. In the same time period, tuition grew by 0.0% and fees grew by 1.9%. Based on this, we estimate the cost of tuition and fees for this year will total $18,814. For a two-year degree, we estimate tuition and fees will be $37,852 and for a four year degree to be $76,611. This does not include additional costs including room and board, transportation, and books. Look at the following chart to discern how BGSU tuition and fees might develop including residency based discounts in the future.